Today’s Fact That Makes Me Feel Old: it’s now been a full 25 years since Tom Cruise became a star. 1983’s Risky Business wasn’t Cruise’s first flick; indeed, he’d been in fairly high-profile efforts like 1981’s Taps and The Outsiders. His charismatic turn in Business brought him mass attention, though, and launched him on the path to his current status as a Hollywood icon. In Risky Business, Cruise plays high school student Joel Goodsen. A senior who frets about college, his future and life in general, he always plays it safe. This changes when his parents go out of town for a few days. At the urging of his friend Miles (Curtis Armstrong), Joel manifests some mild acts of independence/rebellion, all of which culminate in Miles’ recruitment of a prostitute. Joel resists this, but he eventually changes his tune. Though his initial encounter goes awry, he calls Lana (Rebecca De Mornay). He enjoys his night with her but comes up with insufficient funds when he needs to pay her. She takes his mom’s valuable crystal egg as compensation. Actually, Cruise’s flamboyance almost harpoons things at times, as I think Joel occasionally handles his transition into smooth-talking pimp a little too smoothly. One minute he frets about his future, and the next he leads a high-speed car chase through the streets of Chicago. Joel goes from one extreme to the other without a great deal of logic or fluidity. Still, Cruise’s positives outweigh the negatives. Someone else probably could have made the changes more believable, but Cruise’s charm helps carry the movie, so that acts as compensation. It also shows its era, as those of us who were teens in the Reagan years can clearly relate to its money-hungry characters. Granted, I don’t think wealth has gone out of fashion over the last 25 years, but there was a certain “greed is good” vibe to the Eighties that I don’t think has resurfaced, at least not in the same way. That attitude comes through clearly in this movie. But that doesn’t make Business dated – or at least not really dated. Sure, it looks and sounds like the Eighties, but the message and the attitude remain universal. If anything, kids today undergo many more pressures than we had 25 years ago. Schools are more competitive and force teens to make even bigger sacrifices, so I’m sure they can identify with a guy who manages to mildly rebel against this. I can’t say that Risky Business is a great movie, and how much it appeals to you may depend on your stage of life. Clearly the flick spoke to me a lot more when I was 16 than it does now that I’m 41. Nonetheless, it provides an engaging, surprisingly mature look at a teen fantasy that continues to satisfy after 25 years. 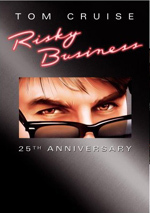 Risky Business appears in an aspect ratio of approximately 1.85:1 on this single-sided, double-layered DVD; the image has been enhanced for 16X9 televisions. While I thought the transfer replicated the source material fairly well, it remained a lackluster presentation. Sharpness varied. The movie usually looked acceptably detailed but rarely much more than that. Not too many scenes looked really ill-defined, but few came across as particularly distinctive, as most of Business was acceptably concise and no more. No issues with jagged edges or shimmering occurred, and edge enhancement was minimal. Source flaws were minor as well. I noticed the occasional speck, streak or mark, but only a handful of these manifested themselves through the otherwise clean image. Colors seemed erratic. They displayed the usual Eighties murkiness much of the time, but they also occasionally looked reasonably vibrant and distinct. For the most part, the hues came across as somewhat flat, though the daytime exterior shots looked better. Black levels tended to appear somewhat inky, while shadow detail was a little too dense much of the time. Interiors seemed fairly muddy. All of this fit the profile of many Eighties movies, but I thought the transfer did enough right to still merit a “B-“. Though this wasn’t a particularly attractive film, there wasn’t much that could be done with the source material. The Dolby Digital 5.1 soundtrack of Risky Business seemed pretty solid. Music used the speakers in the most dynamic fashion, as the score and songs demonstrated active stereo imaging. Effects were a lesser partner, though they occasionally came to the fore. For instance, some train shots provided nice movement, and they also blended well with the back channels. The surrounds didn’t have a lot to do here, but they reinforced the front and sporadically threw in unique information such as during those train sequences. When we head to the disc’s extras, we open with an audio commentary from writer/director Paul Brickman, producer Jon Avnet, and actor Tom Cruise. All three sit together for this running, screen-specific chat that looks at cast and performances, the script and its creation, sets and locations, relationships during the shoot, music, and various anecdotes from the production. The Dream Is Always the Same: The Story of Risky Business lasts 29 minutes, 27 seconds as it mixes movie clips, archival materials and interviews. We hear from Brickman, Cruise, Avnet, filmmakers Cameron Crowe and Amy Heckerling, film critic Peter Travers, producer Steve Tisch, film historian Stephen Tropiano, and actors Bronson Pinchot, Curtis Armstrong, Rebecca De Mornay, and Joe Pantoliano. 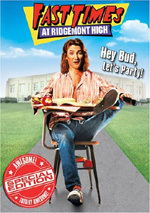 “Dream” examines the teen movie marketplace of the early Eighties and how Business fit into the era, the film’s story/themes and approach to the material, Brickman’s directorial debut, the script and attempts to find backing, casting and performances, music and visual choices, various scene specifics, the flick’s original ending, and the movie’s reception. Next we find Original Screen Tests. These feature Cruise and Rebecca De Mornay and they last a total of 14 minutes, 33 seconds. We see a little of these in “Dream”, but here we get a more complete view of their interactions. The tests mostly feature Cruise and De Mornay together. We also get some comments from Heckerling, Tisch, Cruise, Brickman, Avnet, and De Mornay. For better or for worse, Risky Business made Tom Cruise a star. His performance continues to charm, as does the movie itself. It shows some weaknesses but still works. The DVD offers acceptable picture, pretty good audio, and a mix of interesting supplements. Business remains an iconic flick after 25 years, and this release serves it reasonably well.